Striker Alejandro Moreno was drafted by the Philadelphia Union today in the expansion draft. 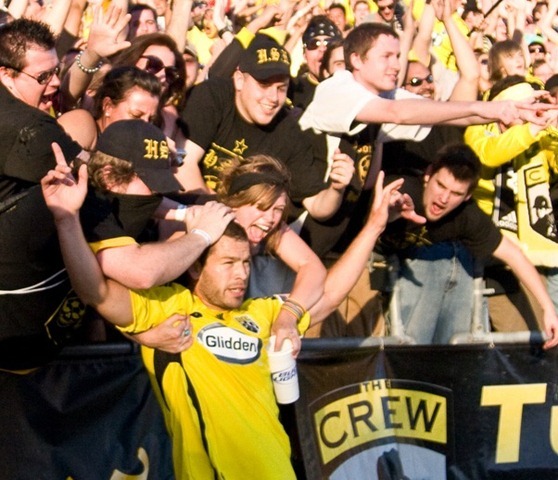 A fan favorite, Moreno came to the Crew in 2007 scoring 20 goals and 12 assists in 74 games (69 starts). His form dipped in 2009 as he scored 4 goals in 22 games (17 starts). He was out of contract and his future with the team was already up in the air. I have many great memories of Moreno. I got the first idea that 2008 would be a good year when, in the opener against Toronto, I watched Moreno expertly beat an offside trap and score a well taken goal to put the Crew up 2-0 and kick off the season in grand style. I probably won’t ever forget his goal in MLS Cup that game the Crew a 1-0 lead at the time. It was a classic Ale goal, he took a Schelotto pass and just put his head down and kept going. He hustled past the shambolic Red Bull defense and slipped one past Cepero. It was a goal that settled down a shaky Crew team as they cruised to the Cup. I think this is probably the best possible outcome for Columbus. Moreno was not going to come back at his $100,000 plus cap number. Lenhart and Renteria would press him for playing time. At 30, Moreno was already showing signs of wearing out. Never a speedy player, he looked down right glacial at times late in the year. I wish Ale nothing but the best in Philadelphia and beyond. He has always been a classy individual. He would stop to talk to any fans who asked him for an autograph and he was most gracious to answer this novice writers questions. Though he only wore a Crew kit for two and a half years, he made a tremendous mark. ← Make or Break in Schelotto Saga?